Anyone with a meaningful connection to the nine-county Bay Area is invited to “share their story of belonging” by January 2. This call is deliberately open-ended. For others, maybe they carry a sense of belonging with them. I was inspired to add this section by Brené Brown’s Braving the Wilderness, in which she argues that true belonging, to paraphrase Maya Angelou, is belonging everywhere and nowhere. If you haven’t yet submitted, please do! There’s less than 2 weeks left before the January 2 deadline. As most in the SF art community members know, Galeria de la Raza was one of the birthplaces of the Chicano art movement. It was located on 24th Street in the Mission District for as long as I can remember. Over the past few months, it’s battled a 100% rent increase. Rivera is announcing that they’re going to move, and find another location, but it may be nomadic—everywhere and nowhere—for the next two years. It’s interesting to think how a place matters (obviously they’d want to stay in the Mission), while an identity or soul doesn’t have to reside in a specific building. Maybe carrying your belonging with you is a form flexible, strategic resilience in the face of gentrification and displacement. Maybe your sense of belonging can be tied to a place and also carried with you. More people are thinking about moving to a new city. Some 25 percent of those looking at homes for sale were searching outside their current metropolitan areas — up from 22 percent during the same period in 2017. The general trend was away from pricier East and West Coast markets and toward more affordable inland areas. The top 10 most-searched destinations had an average home price of $150,000 less than the top 10 areas people were contemplating leaving. San Francisco tops the list of 10 cities with the greatest potential outflow. This is pretty outsized, considering that San Francisco is the 13th most populous city in the US. TC was recently telling me that everything about San Francisco—from losing collaborators who move away, to the cost of living, to the ever-increasing traffic—feels like it’s pushing you out, and you have to proportionally become more determination to stay. I replied that it sounds like San Francisco is turning into New York City. I’ll think more about this. I’m interested in the love-hate relationship some people have to NYC. For those who can afford it, escaping the city (summering on the Hamptons or apple picking upstate) is considered a key to staying sane here. This has more to do with the place itself—crowdedness, tourists, and heat waves in the summer, and the general logistical nightmares of navigating such a large, expensive city. I wonder how love-hate relationships figure into the Bay Area. The negative emotions I’ve heard about are often about the impacts of changes, not qualities of the place itself. For me, when I lived in Oakland, it was a respite from San Francisco, but now Oakland is the US’ 5th most expensive city to live in, just after NYC. One of the challenges of this project is balancing rays of light against the doom and gloom of San Francisco’s changes. Selected artists comprise 1:21.4, or 4.6% of applicants. *Two residents were invited, for a total of seven residents in 2017. Recent notes on memory, navigation, and embodiment. I love thinking about embodied cognition (how our mental life is shaped by the physical roots of experience). Recently, a spate of articles has me thinking about where memory lives in the brain, and how the body moving through space is tied to recollection. It’s interesting to consider what impressions you’re embedding physically or mentally. Maybe you’re an art viewer noticing how your eye “moves” through a picture. Or, you’re an art handler “walking through” an exhibition design in SketchUp. Perhaps, you’re an artist envisioning how people interact with an installation or your participatory artworks. I wonder about the many ways in which aesthetic experience is one of navigation, envisioning, recording, and recall. Through the DOT’s Adopt-a-Highway program, artist Katarina Jerinic utilizes a parcel next to the Brooklyn Queens Expressway as land art for site-specific interventions. Katarina Jerinic, PSA for Passers-by #2 (video still), 2014, digital video, 57 seconds. // Source: KatarinaJerinic.com // HT: The Center for Book Arts’ Map as Metaphor lecture series. Kim Tingley’s “The Secret of the Wave Pilots” (NY Times, March 17, 2016) is a fascinating look at a Marshallese form of seafaring using knowledge of waves only. She writes beautifully about the neurological and social ties between memory and navigation, as well as the fascinating history of the Marshall Islands. I highly recommend the entire article. My favorite passages to think about for art practice follow. Though journey and destination can be clichéd metaphors (not to mention signposts, road maps, off the beaten track, forge your own path), what Tingley seems to suggest is that these are fundamentally human concepts. It’s part of our evolutionary legacy to think and understand in terms of physical journeys, because we each have this kind of brain in this kind of bipedal body. I’m always amazed by the peculiar concreteness of dreamed environments: the fully rendered qualities of light, the verisimilitude of prioperception. How awesome that this takes dozens of AI specialists and servers to re-create, and yet our brains achieve this when we’re literally not even thinking about it. That’s a good reminder: Be where you are. Don’t worry about the fastest route. Learn about your environment and build up your mental map. The same can be said about the creative process. I need reminders to stop over-valuing productivity, and to experiment in the studio. This is partly my nature, and partly not—as Barnaby Drabble points out, “the increasing application of time and resource management methods to our personal lives”* is symptomatic of larger forces like neoliberalism, and the conditions of immaterial labor, etc. Maps are subjective, and could be more transparently so. —from Shannon Mattern’s excellent slide lecture at Maps as Metaphor at the Center for Book Arts. It’s posted online on her equally excellent blog, Words in Space. —Austin Frakt’s “An Ancient and Proven Way to Improve Memorization; Go Ahead and Try it,” (NY Times, March 24, 2016). This resonants with the core of why I’m an artist. I make objects and exhibit them for a few weeks at a time. While a small portion exists in people’s homes, most are squirreled away or no longer exist. I continue to make objects because I believe that art experiences “live” on as viewers’ memories of firsthand, physical experiences (and secondhand, virtual images on the Web). This speaks to my immense faith in the power of aesthetic experience—a process of viewing, thinking, and feeling—to enrich human experience. **Digression: Here’s an example of how much place and memory are tied. Brandon Brown’s “Limited Access: Art and Gentrification in the Mission” (Art in America, March 30, 2015) mentions Artist’s Television Access and The Lab, two venerable alternative art organizations a few blocks apart in San Francisco. Reading his descriptions of places—even on a small screen, in a noisy gym—flooded me with memories: my first visit to ATA, as a high school student at a Sick ‘n Twisted shorts fest; trading sketchbooks with Erik Drooker at Muddy Waters, where he drew speech bubbles making fun of my slang; as a young art student, viewing Barry McGee’s mural in the labor building; the time I was on a panel with Boots Riley at ATA (and I think Chicken John?) that got hijacked; the doc on Humboldt County tree-sitters; the palpable discomfort of a friend from out-of-town when we met him at 16th and Mission to eat at Taqueria Cancún; Intersection, and how often I’d run into Kevin Chen right in front of the building, day or night, wearing yellow glasses and having a smoke… What makes a space a place are the meanings assigned to it. Personal experiences—pleasant or not, juvenile or formative—are part of what makes San Francisco’s transformation potent. Some art shows I saw in San Francisco and Oakland. When I visit California during holidays, I recall the familiar, discover what’s changed, and encounter weird schedules. It’s catch as catch can. Baby (Medium for Intercultural Navigation): An installation by Michael Arcega @ SFAC Grove Street. Kids dream of floating down a river, and MA has made a real outrigger sailing canoe. It works. Hope you got to ogle it, suspended in flight. The Point: Kirk Crippens in Collaboration with the Bayview-Hunters Point Community @ SF City Hall The SF Arts Commission’s humanizing portrait series continues, and currently ties in to The Last Black Man in San Francisco moment. Here’s an interesting line-up of spaces to visit back-to-back: Kiria Koula (nice fluorescent white cube with cool, linear, geometric interventions), the expanded Ratio 3 (terrifyingly perfect and high-ceilinged white cube with hard edged, linear, oft black-and-white interior design and architectural installations) and CULT/Aimee Friberg (b/w architectural interventions/wall paintings/geometric sculptures). Stephanie Syjuco @ Workshop Residence. A combination of things difficult not to like: a residency, workshop, and artist’s multiple store, with very desirable objects. Even shopping-agnostic-I couldn’t resist a tote bag to support the artist and program. The price points were mostly out of my range, but nobody said that manufacturing things in SF would be cheap. Dud: Oakland Black Friday. I tried not to spend money, out of respect for Ferguson, and lingering memories of Adbusters’ Buy Nothing Day. I had some help—parking meters were free thanks to “Plaid Friday” (Is the Oakland Chamber of Commerce targeting lumber-sexuals?) and Arizmendi was closed (in an almost-throwback against the creep of retail hours into the holidays). But I was only able to visit three of four galleries on my list. Admittedly, I failed to look closely enough at their websites to see if they were, indeed, actually open. So Royal Nonesuch Gallery, Random Parts, and City Limits Gallery, I guess I’ll have to check you out another time. Thanks, Johannson Projects, for opening your doors. My dear friend ET has been collaborating with genius Bay Area artists and activists to lay the groundwork for a new, optimistic organization. And they’re launching now! Check out their Arts & Activism Quarterly; it features an interview with moi about the nineties, activism, and art, and includes tons of orgs and people that have inspired me. It also hosts the beautifully-shot, poignant trailer for “The Last Black Man in San Francisco,” by Joe Talbot. Talbot is among the many artists that will be featured in the Society’s kickoff party this Saturday night. It’s where I’d be, if I were in SF this weekend. The Lab’s triumphant return spearheaded by Dena Beard. Keeping SF weird, loud, and experimental. May Day Space, a cultural worker/education/organiging space led by a diverse crew in Bushwick. The Society, of course! Become a member! We won’t concede SF so easily! W.A.G.E. for Work. Six days left to go in their campaign to bring justice for all artists! San Francisco’s relentless economics cuts close to the bone, dismantling Intersection for the Arts. I had the honor of exhibiting at San Francisco non-profit art organization Intersection for the Arts in 2004 and 2012. 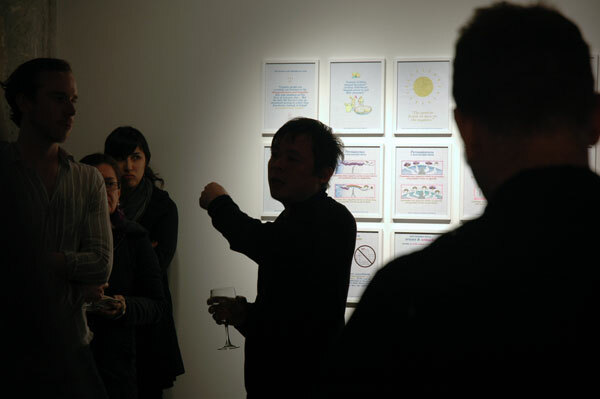 Backlit curator Kevin Chen speaks at the opening of “In Other Words,” 2012. My Positive Signs drawings are on the wall behind him. In particular, curator Kevin Chen has been a major ally to me (he’s the “k” that kicks off this sequence of artistic advancements on Works Make Work). Moreover, he’s been a thoughtful, dedicated contributor towards keeping SF’s art programming current, diverse, and critical. (Here’s a great 2008 SFGate profile that captures his essence, i.e., “Placid, soft-spoken, with a low, late-night-radio kind of voice, Chen brings to his work a combination of sangfroid and compulsive work ethic.”) He’s worked countless late nights personally installing exhibitions; his work as a curator has really been curator/exhibitions manager/installer/art handler/framer. He could also be found delivering erudite introductions to Intersection’s jazz performances, and donating his time and expertise to classes and likeminded arts nonprofits. He’s a practicing artist, drawing detailed graphite drawings inspired by San Francisco’s skyline. I came away from my first exhibition at Intersection’s Valencia Street location impressed with the staff’s commitment to excellence and inquiry despite a shoestring budget. They’ve stayed afloat amidst recessions and busts, but they won’t survive San Francisco’s current climate intact. They’ve laid off curators including Kevin, and will suspend programming. See Christian L. Frock’s “San Francisco’s Intersection for the Arts Suspends Programs, Lays Off Curators” on KQED Arts (May 22, 2014) for more info. For many artists, this is another painful, irrevocable loss in the art community, as documented in Frock’s “Priced Out” series. Since I moved away in 2010, people ask if I’ll return to the Bay Area. Its clearly hostile conditions, and the tolls they’re taking on the arts community, do not beckon. Everyone, go to galleries, museums, performances, and any and all cultural events!!! Invest in your local cultural institutions before they are gone…. please! Jerry Saltz makes some interesting observations in “Saltz on the Death of the Gallery Show” in NY Mag (3/31/13). A great thing about galleries … is that they’re social spaces…. places where one can commune with the group mind. playing a diminished role in the life of art. When so much art is sold online or at art fairs, it’s great for the lucky artists who make money, but it leaves out everyone else who isn’t already a brand. This art exists only as commerce, not as conversation or discourse. ….Many artists are now in “abundant production,” seducing collectors on the prowl for stuff to fill their oversize atriums. Art doesn’t have to be shown in New York to be validated. That requirement is long gone. Fine. But… a good Los Angeles dealer chided me for not going to art fairs, not seeing art in L.A. and London, and not keeping track of the activity online. He said I “risked being out of touch with the art world,” and he was right…. I brooded for months over this. Then … I started thinking about “the art world.” Something clicked and brightened my mood. There is no “the” art world anymore. There have always been many art worlds, overlapping, ebbing around and through one another. This last realization seems a bit belated. Artists outside of NYC have had to cultivate their own art worlds for ages, not because of the recent overabundance of fairs, but because of long-standing NYC-centrism. NYC is home to major publications and art commerce, yet artists outside of NYC have found ways to persist—regardless of the facts that NYC critics focus on NYC shows (ahem! ), and art fairs diminish Chelsea galleries’ audiences. And, paradoxically, it seems as if Saltz is using the de-centralization of the art world to justify his own NYC-centrism. No one critic could see all the art in these different art worlds, but could certainly try harder to get out of his own city—and borough—more often. When I go to galleries, I now mainly see artists and a handful of committed diligent critics, collectors, curators, and the like. In this quiet environment, it may be possible for us to take back the conversation. Or at least have conversations. While the ultrarich will do their deals from 40,000 feet, we who are down at ground level will be engaging with the actual art—maybe not in Chelsea, where the rents are getting too high, but somewhere. That’s fine with me. That Saltz has been able to seek out dialogues in commercial galleries seems like a fluke, in my book. Most Chelsea galleries feel too-cool-for-school to strike up conversations. Those spaces where dialogues happen, where art by artists’ artists is shown, are non-profit, alternative, and artist-run spaces. NYC has its share, but nothing like the vibrancy of SF Bay Area’s community, in my opinion. I also sense that many NYC alternative spaces show a higher proportion of artists with commercial gallery representation (artists further along in the “emerging” spectrum) than those without. It would be fantastic to take a survey comparing the proportion of represented artists shown at Artist’s Space, White Columns, Sculpture Center, Socrates Sculpture Park, Smack Mellon, Momenta Art, Art in General, Apex Art and Flux Factory against those at Southern Exposure, Intersection for the Arts, The Luggage Store, The Lab, SF Camerawork, Pro Arts, and San Jose ICA. It would beg the question of what alternative art organizations are for, who they serve, what kind of dialogues they create, and with whom. What if more commercial galleries fold in NYC, but an equal number of new non-profit and alternative spaces sprung up in their wake? What if they focused on truly emerging artists—not trying to compete with commercial spaces, but were real, imaginative, risk-taking alternatives? What if big-time critics visited and wrote about alternative spaces more often, not just when they mount shows by established artists or shut their doors? What if, essentially, NYC can learn a thing or two from other cities like San Francisco?